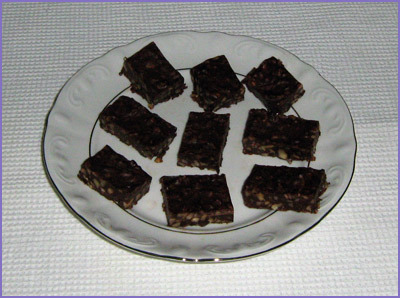 Chocolate (without sugar), margarine, walnuts. First one needs to melt about 100 grams of chocolaate in a water bath. To this, 40 grams of margarine and 50 grams of chopped walnuts should be added. This is mixed thoroughly and poured in a shallow mold. After it cools down, one can easily form cookies of the desired shape by using a knife.